E-commerce giant. Second-largest private employer in the United States. First company to hit $1 trillion. These are popular descriptions that first come to mind for individuals posed with the question, “What is Amazon.com?” However, the one description that many people are unaware of, and is perhaps the second most important to labeling Amazon.com, is “3rd largest digital advertising platform”. That’s right, Amazon is expected to become the 3rd largest digital ad platform by the end of 2018. The company is projected to gain $4.6 billion in 2018 from digital advertising solely, that is up 60% from the original forecasts of $2.89 billion. So, you are probably thinking, why is this happening? According to a 2016 Pew study, 51% of Americans think it is wrong for social media sites to be able to exchange free access for profile information that is used to target advertisements. This model, commonly adopted by digital ad giants such as Google and Facebook, allows companies to profit significantly from their users. In 2017, the average revenue generated per Facebook user was $20.21. If this number isn’t bad enough, the average revenue generated per North American Facebook user was even higher, at a staggering $82.00. These numbers outrage users, as social media platforms are profiting at their expense. Mobile phone or device users feel that companies such as Google and Facebook harass them with ads that are entirely too personal and accurate. That being said, it is clear that the current means of online advertising need to change. The question is how? 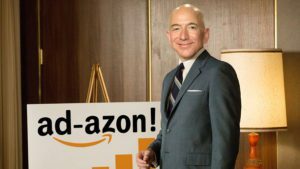 Fortunately, Amazon has a secret strategy to change the shape of digital advertising for the better! Using an aggressive E-commerce structured ad strategy, Amazon will be able to give competitors such as Google and Facebook a run for their money. Amazon’s digital ad strategy is different from competitors in that a user’s value will come from his or her purchases as opposed to his or her profile. This will provide greater clarity into how ad buys influence purchases, a loop that competitors can’t close. This feat in digital advertising is accompanied by many beneficial long term outcomes. 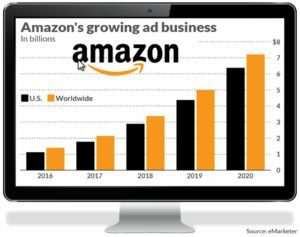 First and foremost, Amazon’s market share in online advertising is going to continue to grow and rival that of Google and Facebook. If Amazon continues their upward trend, they will gain a larger share then other competitors in the $88 billion digital ad market. This trend can be seen in the graphic to the left. Amazon is not the only recipient of the benefits resulting from this change. All people, particularly Millennials, will become more open and accepting of advertising. Companies can expect to see an influx of brand ambassadors or engagement of customers with their brands. Because of Amazon’s new strategy, people will change the way they perceive or view advertising. 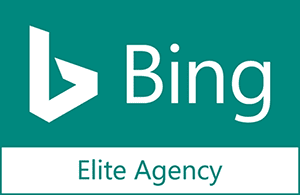 Advertising will no longer be viewed as a hassle or annoyance but instead an acceptable, and useful tool.